Air HES stands for air hydroelectric station. It is a new way to effectively obtain green energy, with minimal costs. Be the first to know when Air HES comes to production. We all use electricity on a daily basis. That means every one of us needs an energy source. Today we use nuclear power plants, regular hydroelectricity plants and thermal power stations. However, none of these energy sources are actually safe, and the way they work is harmful to the environment. But we are able to change it, with your support. We want to make green and cheap energy available for everyone in the World. In fact, we don’t only want it, but we also know how to do it. Air HES is an effective and completely green energy source, that also gives you clean water that you can drink or use however you want. If you feel this is something you want the World to have, please consider participating in the crowdfunding of the project so we can finally build a reliable prototype and run all the necessary experiments. It is known that the solar energy reaching to the planet is about 10,000 times greater than the needs of humanity. About a quarter of it goes to the evaporation of water and virtually always more or less evenly accumulates in the atmosphere at any point around the world. Since the annual precipitation is about 1 m of rainfall with an average height of 5 km, this gives a potential capacity of about 810 TW, which is more than 60 times greater than all the current needs of humanity (13-16 TW). Standard hydroelectricity can only use a small fraction of this energy, because all precipitation lose most of their potential energy on the way to the ground to overcome the resistance of the air and hit the ground. In order to use this potential energy more cost-conscious, it is necessary to collect the water at that altitude, where it condenses, and use all possible vertical hydraulic head. This is what constitutes the essence of the decision. Interestingly, already having gotten this solution, I began to search the Internet for key words such ideas, and unexpectedly found that in 1915 in one of the articles the genius Nikola Tesla was nearly half a step to the realization of this idea: he was correct in principle estimation of the required resource, but had not found a scheme to implement it, although all technics already was ready for it hundred years ago. It's a pity. If he had pursued the idea, then we would live in a different world—clean, ecological, abundant, without wars for oil, etc... Unfortunately, humanity has lost a hundred years! The scheme of one of the solutions is shown in Fig. Air HES provides a downstream (water‌’s outflow) 1, upstream (water‌’s inflow) 2, conduit (pipe, penstock) 3, the turbo generator 4, mesh, fabric or film surfaces 5, airship (air-balloon) 6, and the fastening ropes (tethers, lines) 7. 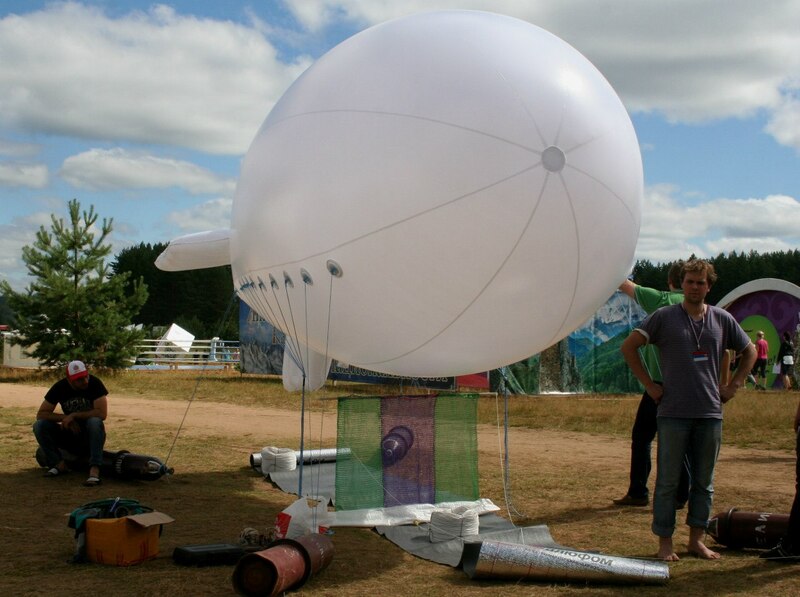 The airship 6 lifts the surfaces 5 at the height of near or above the dew point (condensation level by ARL sounding, base of clouds) for current atmospheric conditions (typically 2-3 km). There supercooled atmospheric moisture begins to condense (or collect LWC from clouds) on the surfaces 5. The drainage system on the surfaces 5 assigns the water in a small reservoir (upstream 2), where water under pressure from whole hydraulic head (2-3 km) flows through the penstock or conduit 3 to the downstream 1 on the ground, producing electricity in the turbo generator 4. The Air HES can be easily mounted in any convenient place for the consumer of electricity and water, simply by lifting and moving it entirely by using the same airship 6. Also, the surfaces 5 can be performed with full or partial metallization (for example, by weaving metal wire). This will increase the structural strength, reduce solar heat, to increase the condensation of water vapor through the filing of an electric field (for example, have experimented with this corona discharge), as well as the need to reduce the ice due to current supply. Generally, icing can be used as the standard mode, since the system has automatic resistance – with the accumulation of ice the whole structure will fall in the region of higher temperature of the atmosphere, and after the melting of the ice itself will rise to the desired height. 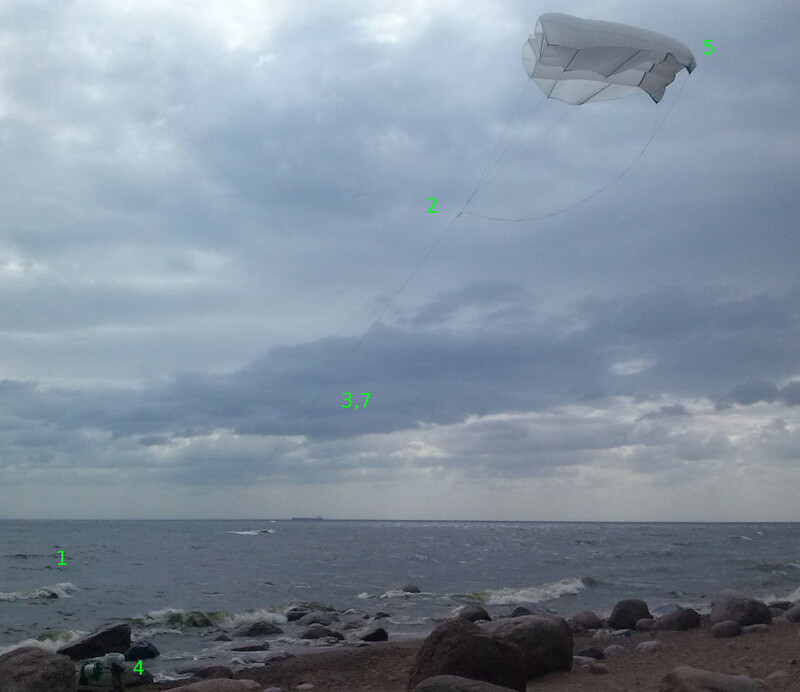 Since Air HES (as well as any other renewable energy) depends on the weather, the best way is to use of combinable system. Obvious that the balloon in the shape of almost flat glider makes it easy to place on the upper surface of the solar panels that will actively work just in the absence of clouds. 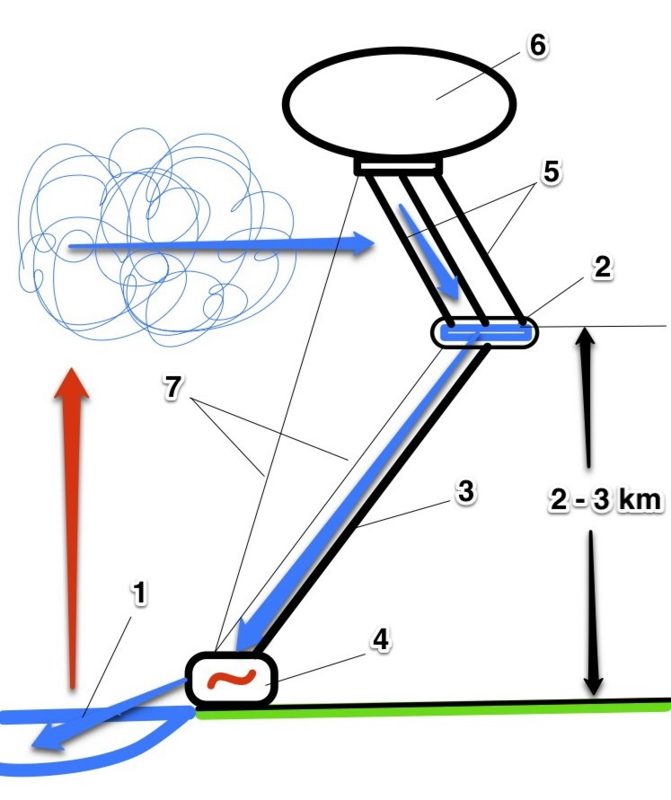 At the same time you can use and the significant wind speed at such height by applying as a fastener a distributed cross-flow turbine under the patent CA 1041872. This will solve simultaneously the problem with delivery of water and energy without using pressure or gravity pipe. Thus, the system will be almost independent of weather conditions. Also, as you know, one of the main problems for renewables is their irregularity (meteo dependence), and hence the need for further significant investments in energy storage. One of the best solutions for today of this task is a pumped-storage plant (PSP). By using a suitable hill, you can build a reversible hydroelectric power plant, which operates either the pump mode, or the regenerative mode. At the same time the efficiency of reversible hydroelectric units are generally much worse than conventional water turbines. AirHES of cascade type can elegantly solve this problem, and at the same time solve the problem of the meteo dependence. If there is a suitable hill, but there is no a river, the AirHES can easily create this artificial "river" and the intermediate upstream by draining its water in natural (meteo dependent) mode NOT to the downstream, BUT to this intermediate upstream of the cascade hydropower plant. Then the lower hydroelectric power station and will play the role of accumulator (PSP) with usual hydraulic turbines, and coordinated work of the AirHES and this cascade conventional HPP will completely eliminate a meteo dependence. 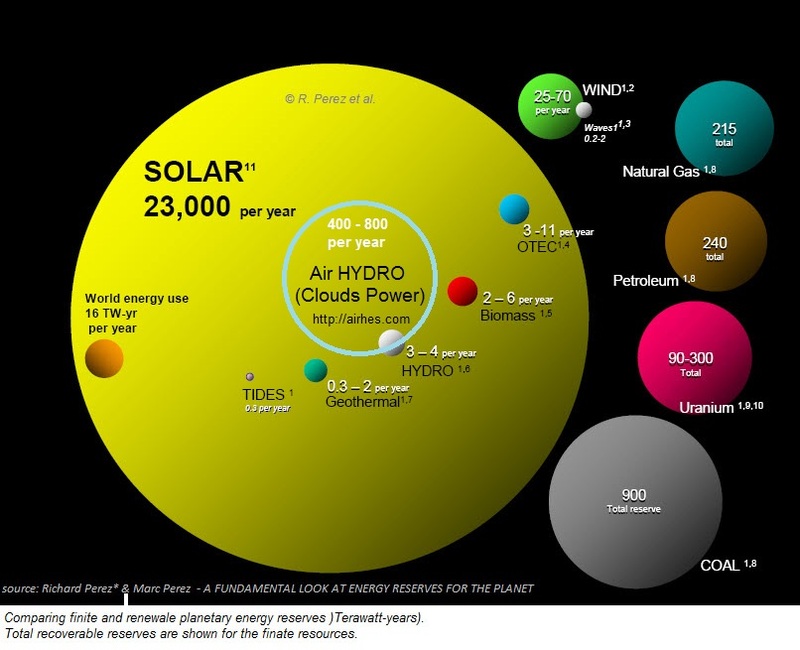 The pump mode in this case can be eliminated - Sun will operate itself as the pump by lifting the water up to the clouds. In terms of electricity generation it works the same way as in conventional hydropower, but the conventional HPS has a general principle drawbacks: they require significant capital expenditures for the construction of dams, occupy large areas under the reservoir, causing damage to the environment and are usually far from the consumer. In addition, there is always a potential danger of possible collapse of the dam. To a certain extent, these shortcomings are a consequence of the relatively small hydraulic heads with the huge volumes of water, typical for the majority of lowland rivers. Nevertheless, the heads of 2 km, like in Air HES, are not extraordinary. There are some plants (Bieudron Swiss HPS) that work with these heads and using a simple turbine, invented in 1889 by an American engineer Allan Pelton. The principal difference Air HES is the condensation of moisture from the air that at first glance it seems funny and impractical curiosity. Nevertheless, there is nothing unusual. In the world there are several great working systems, known as fog collectors. For example, a device for collecting drinking water in Chile was tested in 1987 and is well described with all specifications. Operable unit can even be portable. For example, a tourist or cottager can build it just as a glider or a kite. According to the Chilean install such a surface mesh was given from 3 to 13 (maximal data up to 300) liters per square meter per day. 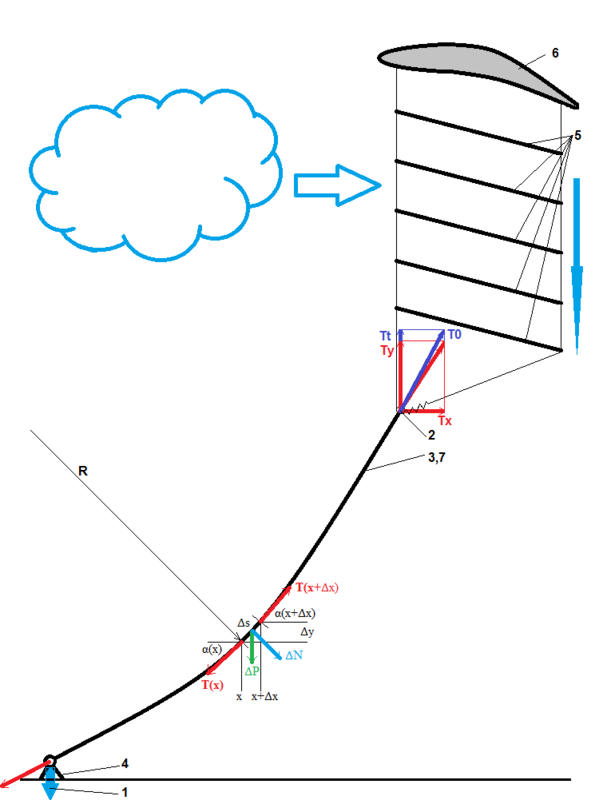 Given that the installation in Chile have been completely passive, and we can actively manage the Air HES, changing the position of the surfaces 5 and height (to a maximum condensation) and the orientation of the wind (for a maximum flow of atmospheric moisture), it is hoped that the yield of water will be significantly increased. But even taking the same level of ~ 10 l/m2/day, we find that only a piece of nylon mesh 10 x 10 m (100 m2) fully meets the needs of one person in the water (~ 1000 l/day) and Household electricity (~ 150-200 kWh/month). Let us estimate, for example, technical-economic data of the Air HES for a small village with 100 people. This setup will provide water to 100 m3/day (1.16 l/s) and have a capacity of 20-50 kW (depending on balloon‌’s height). Balloon 500 m3 raises 500 kg – the shell even $ 2,000, hydrogen is only $ 100 ($ 2/kg) – or about $ 5000 for helium. The total price is ~ $ 10,000 ($ 100 to each inhabitant of the village). The weight is 200-400 kg (with airlift of the balloon is up to 500 kg). The specific capital costs is $ 500/kW. The operational costs is close to zero. In this example the evaluation was carried out for the minimum productivity - passive fog collection system ~ 2 W/m2 for private Air HES. Now let's see what really gives nature, if we want to build a powerful station on the tropical coast - estimation of maximal productivity. In a thundercloud, we have up to 5 g/m3 of water. Let it be only 1 g/m3, the altitude of 5 km, the usual wind speed here of 10 m/s, we get 500 W/m2. For comparing, a NPP unit of 500 MW is equal ~ 1 km2 of mesh for Air HES. Not so much. And NPP unit is on the ground with the same space. And this land is lost. But we need only in a place for the turbine, the rest part is on the altitude of 5 km. Nuclear PP with ~ $ 5000/kW for ~ 2.5 cents per kWh. Air HES can solve all energy problems of mankind. Approximate Market: at least $1000 billion. If someone wants to start production, to bring happiness to mankind and at the same time become the richest man on Earth – contact us, please, because we are looking for a Business Angel and now we need in a little grant and lab/place for creating a minimal prototype. Also you can just invite me to your lab for creating this new green energetics worldwide. NB! for experiment we must have permission to flight on altitude 2-3 km from local authorities.